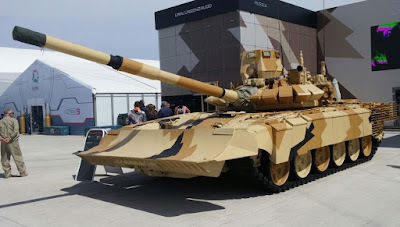 KIEV, Ukraine -- Ukrainian president Petro Poroshenko announced on 14 July that Ukraine is to procure 72 new 'modernised' T-72 main battle tanks (MBTs) from the Lviv armoured vehicle plant. Ukraine is to procure 72 new upgraded T-72 tanks. Speaking to the staff at the state-owned Ukroboronprom facility in Lviv, Poroshenko announced that the deal would also include the production of “a new fire engine based on the T-72” in a deal worth up to UAH920 million (USD35.3 million). Further procurement of T-84 Oplot MBTs is also to be expected, with Poroshenko disclosing that “more than” UAH300 million would be made available. On top of that, 20 Dozor-B light armored personnel carriers will be handed over to the Ukrainian army, he added. "Lviv armor vehicle factory will be paid UAH 920 million, and this is not only for the tanks and the fire engines. The 20 Dozor-B cars that are now behind my back will also be ready to go to the army," Poroshenko said. The president stressed that the Ukrainian army should be equipped with the best technology, both combat and auxiliary, "as it is forbidden to use tank brigades without evacuation vehicles."